Leno, a gregarious and widely admired regular at the club, was one of the early firebrands. Letterman, another top club comic and strike supporter (and a fan of Leno's), thought he was a little out of control. "Jay, bless his heart, couldn't sit still," Letterman recalls of one early mass meeting. "He was behaving like a hyperactive child: jumping up and down, being funny and distracting, to the point where everybody sort of thought, Well, maybe we shouldn't tell Jay about the next meeting." The meetings and negotiations continued. But when Shore wouldn't budge, the comedians, in March 1979, walked off the job. Pickets appeared, with placards bearing slogans like NO MONEY NO FUNNY and THE YUK STOPS HERE. All but a few of the regulars refused to work. Even Letterman  though he felt indebted to Shore, who had taken him under her wing when he arrived from Indiana with his wife in 1975, making him an MC  joined the picket line after he finished a stint as guest host on the Tonight Show. "This was the umbilical cord for a lot of guys, myself included," says Letterman. "Money wasn't necessarily an issue for me, because I had a couple of bucks in the bank. But for these other guys, this was it. This was sustenance." When she saw Letterman picketing, Shore was crushed. "I watched him from the bay window here," she would recall years later, frail and shaking from a nervous disorder and sitting in the empty showroom at the Comedy Store. "I was taken aback. I was crying. Three and a half years working with him, every night. I called him that night at his apartment. I was totally choked up. And he said, 'Those comedians are my friends. And they'll be my friends for the rest of my life.' I said, 'I'm sorry to hear that, David.'" Says Argus Hamilton, one of the comics who was closest to Mitzi: "It broke her heart." The poverty-stricken comics were far less prepared for a long walkout than the relatively well-heeled writers today. Shore closed down her club, then reopened it, using the few loyalists willing to cross the picket line and some neophytes who saw an opportunity for some stage time. When she made a compromise offer to pay the comics $25 a set only on weekends, some of them, like Garry Shandling, thought it was fair and went back to work  a blow to the comics' shaky solidarity. "I think there was a lot of good that was accomplished by that strike," says Shandling. "I certainly didn't cross the picket line just to work. But I thought it could have been resolved. It did not need to be dragged out." Tensions between the strikers and the nonstrikers grew. 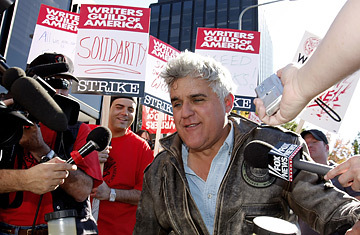 One night, the bad blood got out of hand as one of the antistrike comics tried to drive a car through the picket line, brushing some of the comics and knocking Leno to the pavement with a loud thud. Dreesen ran over to him, panicked that he had been seriously hurt. Leno gave Dreesen a wink; he was only feigning an injury and had thumped the car with his hand. But he got hauled off to the hospital in an ambulance anyway, and the incident seemed to sober up both sides. "Mitzi called me 10 minutes later and said, 'Let's settle this thing right now,'" says Dreesen. On May 4, a settlement was reached to pay the comics $25 per set on both weekends and weekdays. After a six-week walkout, the comedians went back to work, claiming victory. The strike's impact was far-reaching. Comedy clubs in New York City began paying their comics as well. Clubs that were springing up around the country were then forced to boost their fees too, to lure more top comics out on the road  launching the comedy  club boom of the 1980s. All of which was part of laying the groundwork for a culture in which comedians turned TV hosts help set the national agenda and have would-be Presidents as guests. Letterman and Leno may look more like management than labor these days  more Mitzi Shore than strikers. But they haven't forgotten the old grievances. They know all the lines.